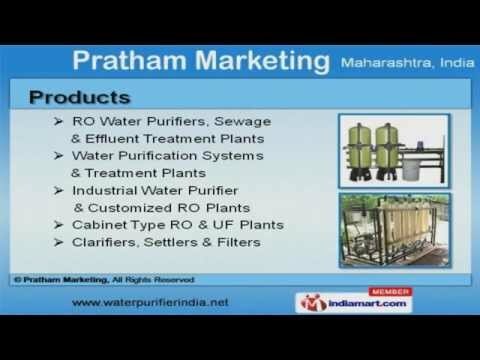 Welcome to Pratham Marketing, Supplier and Trader of Water Purifiers. The company was established in 2001 at Pune. Our State of the art facilities and Experienced R and D department help us to Cater Indian Subcontinent. Bombay Time Limited, Serem Institute and Premer Auto Mobile Limited are some of our esteemed clients and we are backed by Customized and cost effective products. We offer a vast range of RO Water Purifiers, Water Purification Systems and Treatment Plants. Our RO Water Purifiers, Sewage and Effluent Treatment Plants are a class apart. Water Purification Systems and Treatment Plants offered by us are available at industry leading prices. Our Industrial Water Purifier and Customized RO Plants are well known for their impeccable performance. We are highly instrumental in presenting a wide spectrum of Cabinet Type RO and UF Plants that are highly efficient. We are one of the trusted names of the industry engaged in offering genuine quality Clarifiers, Settlers and Filters.